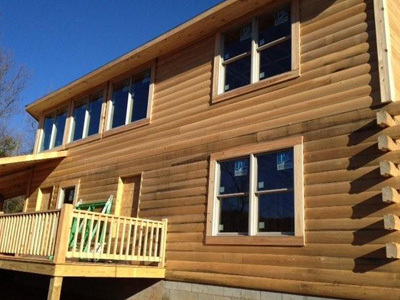 Log home contractors can make the log home construction process much less difficult and time consuming. A good contractor can ease the burden involved with scheduling, hiring sub-contractors, buying materials and supplies, as well as overseeing the entire physical log construction process from land excavation to landscaping. Some new log home owners choose to become their own “log cabin contractor” and sometimes need help with certain parts of managing their log home construction project. As an “owner contractor”, you may need experienced project management and scheduling help. Other owners may choose to work with a Performance Log Finisher partner licensed general contractor. Working with a professional log cabin contractor usually gives you access to a network of specialized log home subcontractors. To get your project start right, or even if you are deep into the project to only find you need help, call us at 800-781-2551 or send us an email now. We would love to provide our expert log home construction management services to you in any phase of your building project. “I just want to thank you as I will thank the guys – the experience with them was nothing but wonderful.They were professional, informative and just great to talk to.